Discussion in 'Mobile Phones Forum' started by the porter, Feb 25, 2013. Is it 1am on the 15th (our time) ? I think my husband will be wanting this. My contracts up in August so probably get this for him then, then he can get me the Note 3 (assuming that comes out before his contract is up in December). He wasn't to impressed with the S3 (loads of people he knew had problems with the S3, and a couple said it broke to easily), he has a small crack on his S2 at the top so he needs an upgrade soon me thinks. hope not , that is far too wide , looks ugly , if that is it i wont bother . Same here. Just someone's Photoshop to make iPhone-esqe looking I think. Looks better than any of the Galaxy phones I've seen or had, think HTC One looks fabulous, this is just the wider brother of the HTC. Would actually make the jump if the design is anywhere near this photoshop. That isn't the Galaxy S4. it be a miracle if samsung made a mobile from a aluminium or a glass body rather than their cheap plastic body. 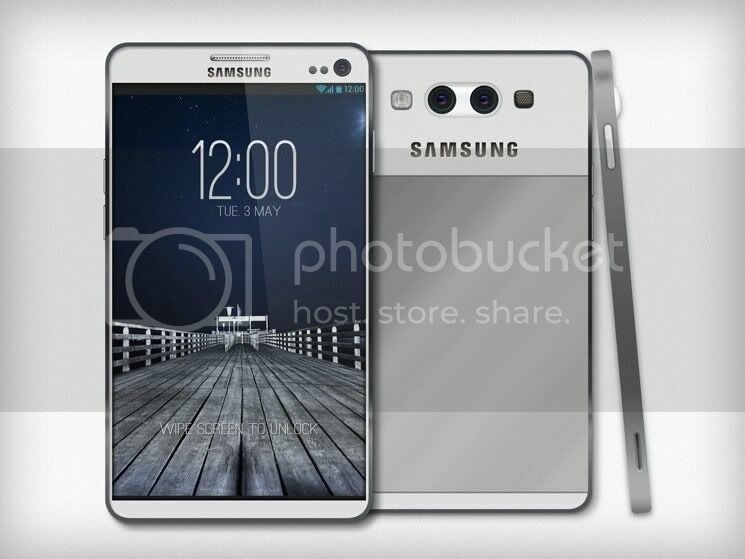 That pic of the S4 looks good imo. I would buy it if it looked like that and wasn't plastic. Aluminium construction with flat back please. Samsung appears to have upped the game looking at those specs and features. Makes the Sony Z and HTC one look like yesterday's phone. If this is indeed released on 14th Mar, Apple really need to bring out an IPhone 6 rather than their IPhone 5s. They really will fall behind if their proper new phone takes another 18months to be released. The only thing is if its going to have a ridiculously small bezzle, which looks great from a looks point of view, but is sadly crap from a usability point of view, as you'll be pressing things by accident all the time just by picking it up. It already happens now with my Note 2, any thinner, and it'll be extremely irritating. Couldnt agree with you more its a pita on both the s2 and s3. The Ativ S I'm currently using has the power button a bit higher up on the right edge. I think that may be a better way to go, allowing locking and unlocking without changing grip yet unlikely to accidentally hit it. I found having the button on top with our HTC One a little hard work, Apple can get away with it as their handset is so small. Smart scroll - another gimmick that nobody will use after showing it off to their mates, just like all that gesture based crap that nobody uses on the S3 and Note 2. It's gonna be horrible plastic again isn't it!? yeah i agree all that stuff is just pointless to me, id rather just have stock android running.